The Castle has been transformed into an inspirational, world class facility for visitors to Durlston and the Jurassic Coast. Conservation of Durlston's internationally important wildlife, landscapes and geology will also benefit, ensuring future generations can still "look round and read great nature's open book". With your help this vision has become a reality. 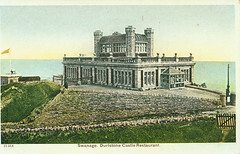 Durlston Castle was built between 1887 and 1891 as the centrepiece of George Burts Durlston estate. 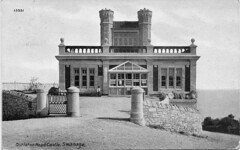 Dorset County Council and partners have developed the Castle as an integral part of the Park and established a world class Gateway Centre for visitors to Durlston and the Jurassic Coast World Heritage Site. 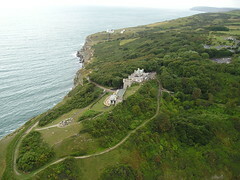 The main goal of the Project (when begun in 2004) was and is to ensure that Durlston retains it's integral beauty, tranquility and wildlife importance whilst enhancing the areas in and around the Victorian Castle. In 2008 the Project was awarded a £3.23m grant from the Heritage Lottery Fund. The remaining £2m was raised through sponsorship, fundraising and grants. The main building contractor (Greendale Construction) started building work in April 2010 with completion in November 2011. Background work has been taking place since 2004, when the Castle lease was re-acquired by Dorset County Council. The development work included drawing up detailed plans for the construction and operation of the building including, kitchens, electrics, alarms, access, and the content and design of the interpretation for the exhibitions and displays. Award-winning architectural consultants Long and Kentish heading the building design team. The interpretation team included Exhibition Designers David McCabe Associates, AV Designers Centrescreen, DJ Willrich and Wildlife Windows all drawn together by consultant Carol Parr. Rangers and other Dorset County Council and World Heritage Site staff. Supporting organisations include: Heritage Lottery Fund, Dorset County Council, South West of England Regional Development Agency, Friends of Durlston, Fine Family Foundation, Viridor Credits, BP, Garfield Weston, Foundation, Dorset Wildlife Trust, Lush Cosmetics, Ernest Cook Trust, D'Oyly Carte Charitable Trust, Jurassic Coast Trust, The Richards Family, Greendale Construction Limited, Martin Cooke - Heritage & Leisure Management, Jurassic Coast World Heritage Team, Dorset Countryside Ranger Service, and many other supporters. Enhancing the management and conservation of the area's internationally important natural heritage including careful zoning policies and the creation of a National Nature Reserve. Improving access and providing greater opportunities particularly for disabled visitors, young people and under-represented groups. Providing new opportunities for learning and family activities based in an exciting, newly refurbished visitor facility. Developing an innovative programme of exhibitions and events in a new gallery space which will connect visitors with the site through art. Expanding opportunities for volunteer involvement through Friends of Durlston and other volunteering and training opportunities. Providing greatly enhanced all weather facilities and other attractions to encourage a wider range of visitors to enjoy a day out at Durlston. Providing the facilities for an expanded range of community uses supporting local events and activities. Improving the management and conservation of the wider 'Burt landscape'. Providing a significant tourism asset for Swanage, of particular value outside the main visitor season. Promoting exercise, healthy living and well being through countryside activity, recreation and enjoyment. Improving people's understanding of their impact on the world around them and encourage more sustainable lifestyles. Working with local schools and universities to encourage project involvement and longer-term associations. Ensuring that Durlston continues to offer a safe, welcoming and tranquil environment for people to enjoy.